Magu: Malami’s statement distorted, says presidency – Royal Times of Nigeria. The Nigerian presidency has described as false and misleading media reports that the Attorney General and Justice Minister, Abubakar Malami repudiated Acting President Yemi Osinbajo’s position over the retention of Ibrahim Magu, as acting chairman of the Economic and Financial Crimes Commission. Online reports said Malami told State House reporters after the Federal Executive Council meeting that the decision to retain Magu was solely Osinbajo’s decision and not that of the Federal Executive Council. “The fundamental consideration about the alleged statement is the fact that at no point ever did the Federal Executive Council sit down to arrive at the decision in one-way or the other as far as the issue of nomination or otherwise is concerned. “So, I do not think it constitutes an issue for the Federal Executive Council to make any clarification because it has never been considered by the FEC,” he said. There should have been no controversy over this statement, as Malami had stated the truth. But there have since been suggestions that Malami was distancing government from the decision by the Executive to retain Magu on the job. The Presidency clarified thus Wednesday night: “The Attorney-General’s point is that decisions on Presidential nominations are matters for the Presidency and not the Federal Executive Council”. Magu’s nomination for the confirmation as the EFCC boss had twice been rejected by the Senate, but the Presidency had re-appointed Magu to head the agency, in acting capacity. Senators at their plenary yesterday declared a fight against Acting President Osinbajo and insisted he must carry out their decision on Magu, that is simply sack him. Since his appointment, Magu had enjoyed the confidence of both President Muhammadu Buhari and Acting President Osinbajo. Last April, Osinbajo explained why the government was backing Magu. 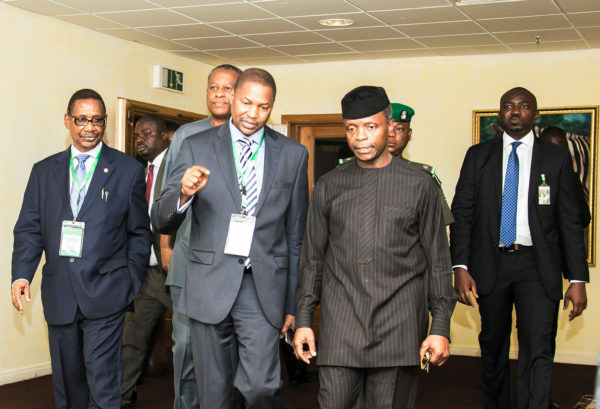 “I’m fully in support of Magu as the EFCC Chairman just as the president is…” Mr. Osinbajo said. Osinbajo, a Senior Advocate of Nigeria also supported the position of another Senior Advocate, Femi Falana, who said the Presidency could use Section 171 of the constitution to make appointments without reference to the Senate. Senators insist that the EFCC chairmanship is not among the positions covered by this section, and also argued that the act setting up the agency prescribes confirmation of the helmsman by the Senate. At the Senate plenary on Tuesday, senators attacked Osinbajo’s statement on the limit of senate’s confirmatory powers. The Senate, therefore, in a four-prayer motion, resolved to suspend all confirmation requests from the executive until decisions of the legislature is respected by the presidency. The decision of the Senate arose from a motion raised by Sen. Sani Yerima, following a letter requesting the confirmation of Lanre Gbajabiamila as Director-General of the National Lottery Commission.